I. Biblical Data: The narratives in Genesis presuppose monotheism as the original religion. After its decline Abraham was called to spread the true knowledge of God (Gen. xii. ; Josh. xxiv. ), but the prophetical books still reflect the struggle against idols and idolatry. Even Jeremiah, who lived to see the end of the Jewish state, complains: "According to the number of thy cities are thy gods, O Judah" (ii. 28). The various terms, sometimes expressive of scorn and disdain, which were applied to idols and idolatry are indicative of the wide diffusion of polytheistic cults and of the horror with which they filled the Biblical writers. Thus idols are stigmatized "non-God" (Deut. xxxii. 17, 21; Jer. ii. 11), "things of naught" (Lev. xix. 4 et passim), "vanity" ( , Deut. xxxii. 21 et passim; frequently in Jer. ), "iniquity" ( , I Sam. xv. 23 et passim), "wind and confusion" (Isa. xli. 29), "the dead" (Ps. cvi. 28), "carcasses" (Lev. xxvi. 30; Jer. xvi. 18), "a lie" (Isa. xliv. 20 et passim), and similar epithets. They are made of gold, silver, wood, and stone, and are graven images, unshapen clods, and, being the work of men's hands, unable to speak, see, hear, smell, eat, grasp, or feel, and powerless either to injure or to benefit (Scholz, Götzendienst und Zauberwesen," pp. 45 et seq. ).Idols were either designated in Hebrew by a term of general significance, or were named according to their material or the manner in which they were made. They were placed upon pedestals, and fastened with chains of silver or nails of iron lest they should fall over or be carried off (Isa. xl. 19, xli. 7; Jer. x. 14; Wisdom xiii. 15), and they were also clothed and colored (Jer. x. 9; Ezek. xvi. 18; Wisdom xv. 4). At first the gods and their images were conceived of as identical; but in later times a distinction was drawn between the god and the image. Nevertheless it was customary to take away the gods of the vanquished (Isa. x. 10 et seq., xxxvi. 19, xlvi. 1; Jer. xlviii. 7, xlix. 3; Hosea x. 5; Dan. xi. 8), and a similar custom is frequently mentioned in the cuneiform texts. Although the Jews were forbidden in general to mock at anything holy, it was a merit to deride idols (Meg. 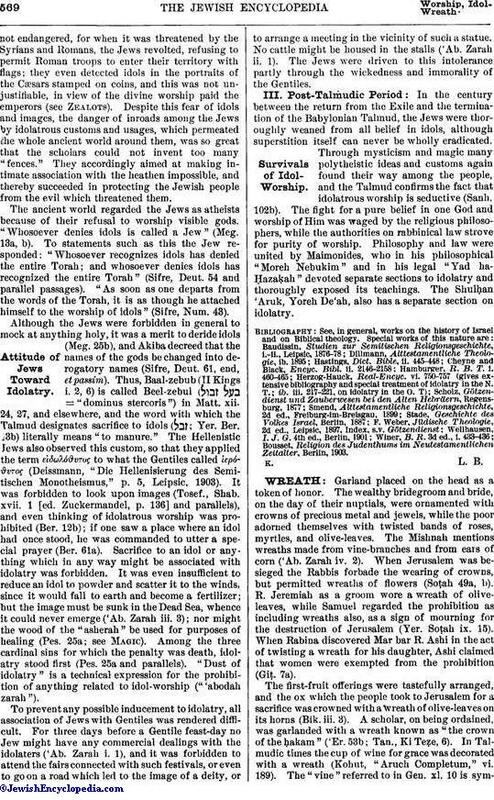 25b), and Akiba decreed that the names of the gods be changed into derogatory names (Sifre, Deut. 61, end, et passim). Thus, Baal-zebub (II Kings i. 2, 6) is called Beel-zebul ( = "dominus stercoris") in Matt. xii. 24, 27, and elsewhere, and the word with which the Talmud designates sacrifice to idols ( ; Yer. Ber. 13b) literally means "to manure." The Hellenistic Jews also observed this custom, so that they applied the term εἰδωλόϑυτος to what the Gentiles called ἱερίϑυτος (Deissmann, "Die Hellenisierung des Semitischen Monotheismus," p. 5, Leipsic, 1903). It was forbidden to look upon images (Tosef., Shab. xvii. 1 [ed. 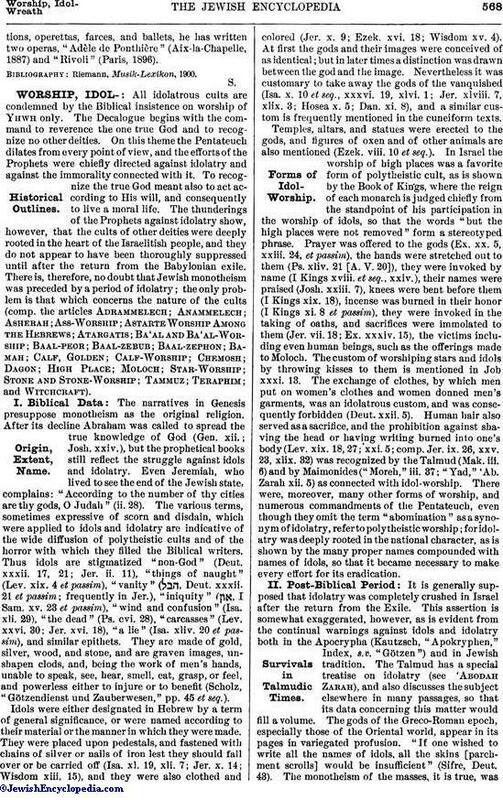 Zuckermandel, p. 136] and parallels), and even thinking of idolatrous worship was prohibited (Ber. 12b); if one saw a place where an idol had once stood, he was commanded to utter a special prayer (Ber. 61a). Sacrifice to an idol or anything which in any way might be associated with idolatry was forbidden. It was even insufficient to reduce an idol to powder and scatter it to the winds, since it would fall to earth and become a fertilizer; but the image must be sunk in the Dead Sea, whence it could never emerge ('Ab. Zarah iii. 3); nor might the wood of the "asherah" be used for purposes of healing (Pes. 25a; see Magic). Among the three cardinal sins for which the penalty was death, idolatry stood first (Pes. 25a and parallels). "Dust of idolatry" is a technical expression for the prohibition of anything related to idol-worship ("'abodah zarah").